And it has veggies in it so you can totally pretend it’s healthy! I always say nobody should come to this blog for pretty photos, but if you have Scratch’n’Sniff installed on your device, activate it now because OMG this dinner is unbelievably good! It’s also highly customizable. Adjust the ingredients to what you like and/or have on hand. Substitute the canned tomatoes for fresh or for a variety that has hot peppers in it, if that’s your thing. Swap out veggies. Try a different cheese. There’s even a different pan style shown at the bottom of this post for those who skew to the nerdy or don’t have a cast-iron pan. A printable recipe is down there too. But assuming you are using a cast iron pan – which I strongly recommend – let’s begin! First, you’re going to need some bacon fat. The easy version of this recipe (and the version I always make) is to use bacon fat I already have on hand as described in this post, and Kirkland Signature Crumbled Bacon later in the recipe, which is a big bag of real bacon bits I always have in the fridge for salads, soups, etc. But if you don’t have either of those, you can fry up four or five strips of bacon in your cast iron pan. Set the bacon to the side and drain off excess fat if you do this, but leave a good coating of fat on the pan. Either way, once you’ve got bacon fat in the pan, chop up a medium onion and brown it in the fat over medium heat. I said “brown”, not “lightly sauté” or “sweat” or any of those other wimpy half-cooked notions. Brown those suckers. Get some flavour going! BOOYEAH. Just don’t burn them. Brown, not black, got it? Right. While you’re browning the onion, get a non-stick pan about the same size as your cast iron pan and coat it with some bacon fat as well. Warm it up on medium-low heat and add four cups of frozen hash browns. By “hash browns” I mean the little stick-like shredded ones, not the cubed ones. Regional dialects make food blogging hard! You probably could also use the freeze-dried kind if you hydrated them but I’m not sure how much one of those containers makes and the cooking time will obviously vary. You could also probably make them fresh by grating your own potatoes and rinsing the excess starch off and then squeezing them over a bowl in a lint-free dish towel and I’m sorry, now it’s already next week so don’t do that unless you are hard-core on whole ingredients. Put the frozen potatoes in the pan. As they thaw and cook, press them down with a spatula to stick together a bit. Dot a few more small bits of bacon fat around upper surface to lube it up. When the underside is browned (check frequently: different brands and types of potatoes brown at different speeds, mine take about 5-10 minutes), use the spatula to cut sections and flip them. This whole process will be going on while you work on the other pan, so let them sit and brown but don’t forget about them! If they get very toasty fast, it’s okay to turn the pan off and stop the cooking. 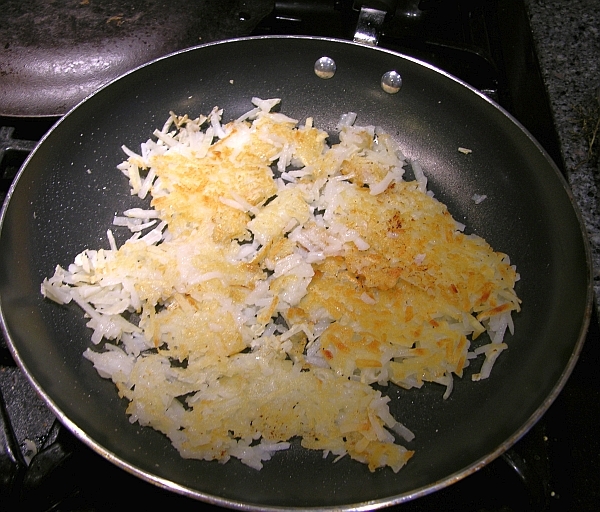 Here are the hash browns already flipped over. When the onions have browned to your satisfaction in the first pan, it’s time to add a pound of lean ground beef (about 96% is good) and lower the temperature of the cast iron pan down to medium-low (I use 3 on my gas stove). Brown that up with the onion still in the pan, all mixed together. Beef and onions in a cast iron pan. Smells like homey yum. While that’s cooking up (and in between checking on your hash browns in the second pan), grate up three medium-sized carrots. Don’t grate your knuckles; nobody wants to taste the cook in this dish. I always grate my carrots to the point where it’s dangerous and then give the end to my kid – who happens to love raw carrots but isn’t keen on big mushy cooked ones – or I nom them myself. See? HEALTHY. Yes. Then mince two cloves of garlic and if you made fresh bacon, chop it up into fine bits. 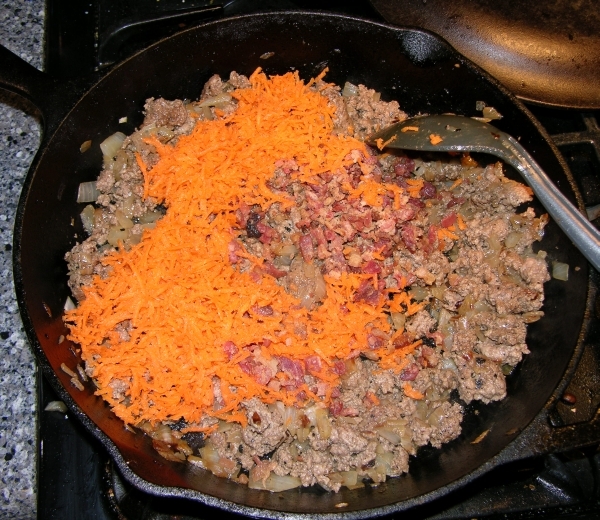 Once the beef has no pink left, throw the carrots and garlic in the pan along with a half cup of the Kirkland crumbled bacon (or your fresh stuff). Mix and cook until you see the carrot bits start to soften and break up, probably in just a few minutes. Carrots make bacon healthy. That’s a scientific fact*. *WARNING: totally not a scientific fact. Next, add a can of diced tomatoes. We really like Muir Glen Organic Fire Roasted Diced Tomatoes because they’re tasty and don’t contain a lot of freaky ingredients. Just open the can and pour the whole thing in, easy peasy. Well not peasy: the peas come later. Also add a teaspoon of beef bouillon paste. I strongly prefer Better Than Bouillon Beef Base because unlike those nasty little cubes, it tastes like beef with salt added, not salt that once got sneezed on by a cow. Plus it’s a paste so it’s easier to add it in and smear-mix it around without having to add boiling water first. If you can’t find it you can probably use the cubes but note that I haven’t tried the recipe that way and I’m not sure how much water you’d have to add. Seriously, get yourself some of this beef base stuff. It keeps for years in the fridge and is worth it. Anyway, mix all that into the cast iron pan (and check your hash browns again if you haven’t already!) and let it warm up for a couple of minutes. Toss in a half cup of frozen peas and a half cup of frozen corn, or about the same volume of any veggie you like (just make sure the pieces are small if frozen, or pre-cooked if a larger veggie). Mix, then heat until the veggies are warmed up, about five minutes. By now your hash browns should be nice and toasty on both sides. Lift the non-stick pan so it’s over the cast iron pan, and then tip the hash browns out like a big pancake right on top of the meat mix in the cast iron pan, sliding the non-stick pan out from underneath them and away as you go. It doesn’t have to be perfect, but shift it around if necessary to get it in a nice layer over the top. Add a half cup of shredded sharp cheddar sprinkled over the top. Move your oven rack to just under the broiler, and then put the cast iron pan in there and broil for three to five minutes, keeping a close eye on it the whole time, until the cheese gets bubbly and starts to lightly toast. Remove immediately. Toasty cheese potatoes over bacon and beef with veggies. You’re welcome. Then serve pie style in wedges as shown in the photo at the top of this post. Yum! Let’s just say you happen to have a Pi shaped pie pan because you contributed to a Kickstarter campaign for Pi Pans (or if you’re reading this post from the future (insert scifi music here) hopefully they’ll be on sale here). Let’s also say you don’t have a cast iron pan. 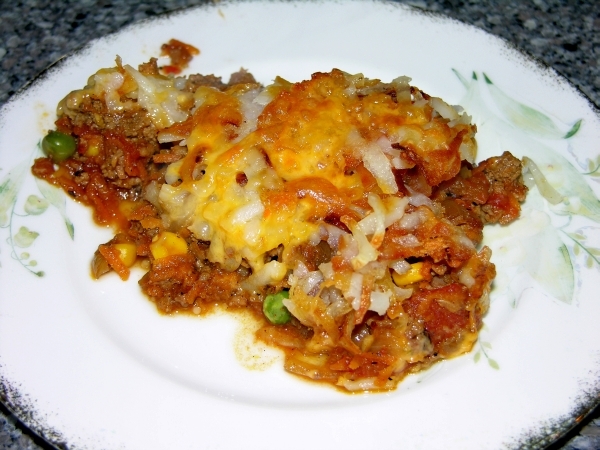 You could make the meat mix portion in a regular dutch oven or deep frying pan, then transfer as much as will fit to your Pi pan (or other oven-safe pie pan), break up the hash browns into chunks and arrange on top, add the cheese and then broil. 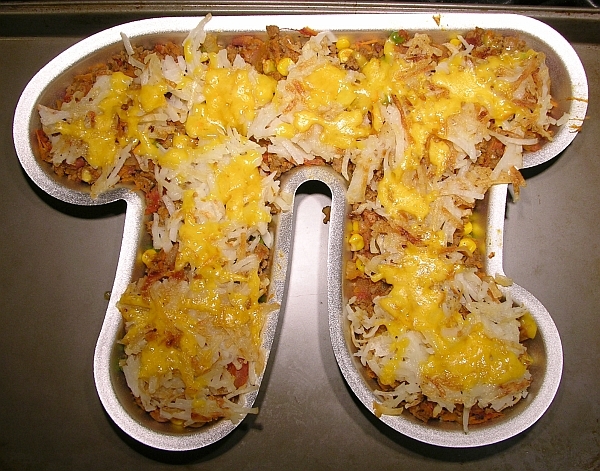 Then you’d have PI SHAPED OMG BACON CHEESEBURGER HASH BROWN PIE! When Peo saw this she gasped, “Is it PI DAY? !” I said, “No, that’s March 14. But I made dinner Pi-shaped because it’s a pie and I got a Pi Pan.” Then she said, “HAHAHA I get it! Can we eat it NOW?” Yes we can, baby. Yes we can. As you can see, you’ve got lots of delicious options for this recipe. Just make it however suits you best, and eat that evidence. Because seriously, OMG. Bacon and beef fried up with veggies and topped with hash brown potatoes and cheese. Coat a cast iron pan in a thin layer of bacon fat. 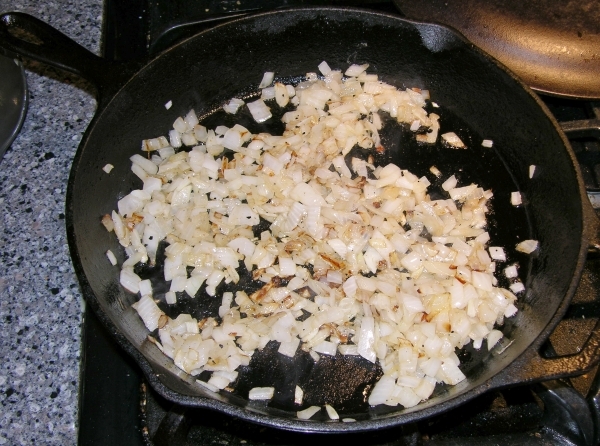 Finely chop the onion and brown in the cast iron pan on medium heat (gas 5). Meanwhile, in a separate non-stick pan, add a thin layer of bacon fat and set to medium-low heat (gas 3). Add frozen hash brown potatoes. When they begin to cook and thaw, press down flat with a spatula. Dot with a small amount more bacon fat. Fry until the underside is brown, 5-10 minutes. Cut into pieces and flip to brown the other side. If both sides are brown before other steps are completed, turn off heat and let sit. 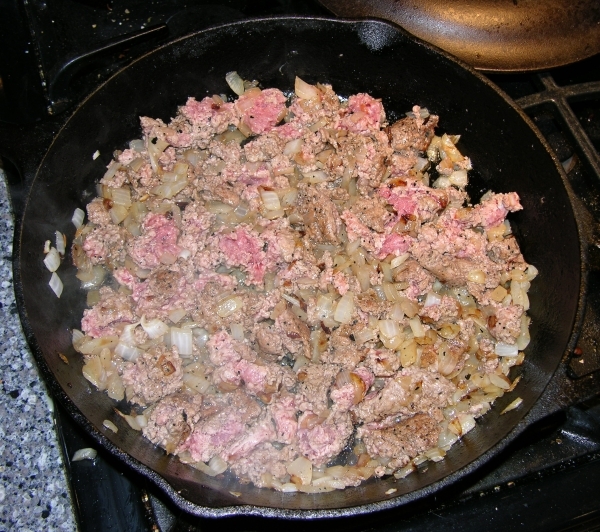 Add ground beef to the browned onion in the cast iron pan and reduce heat to medium-low (gas 3). Grate the carrots and mince the garlic. 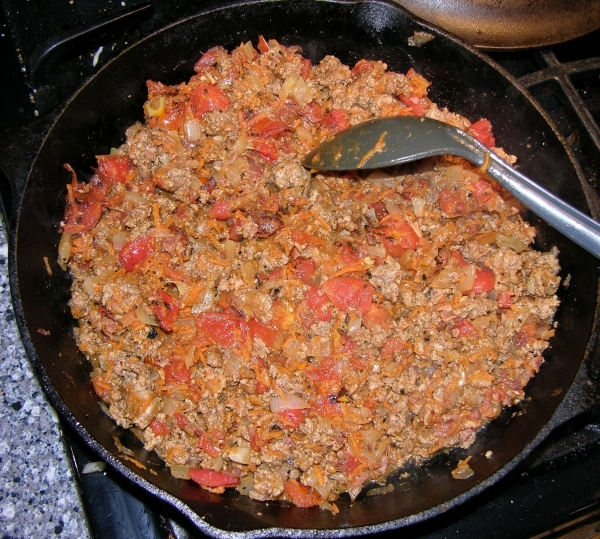 Add carrots, garlic, and bacon to the cast iron pan once beef is no longer pink. Mix and cook until carrots soften, about 3 minutes. Add entire can of tomatoes and teaspoon of beef base, mix and heat. Add peas and corn, cook until they're heated through, about 5 minutes. 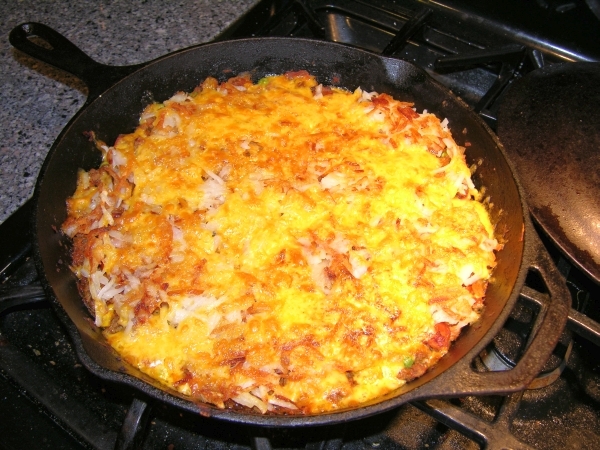 Tip the hash browns out of the non-stick pan onto the meat mixture, adjusting as necessary to make a layer on top. Sprinkle shredded cheese over the top. Set oven rack to below the broiler. Place cast iron pan under the broiler and broil (on high if you have multiple settings) for 3-5 minutes, keeping a close eye on the pan, until cheese bubbles and starts to brown. Remove immediately. This entry was posted in Dinner, Main Dishes, My Recipes, Other Food. Bookmark the permalink. 3 Responses to OMG Bacon Cheeseburger Hash Brown Pie! This sounds delicious and I always say that there is nothing like lubed hash browns to make a meal taste good! !